Following a hygiene inspection of your premises by a food safety officer from your local authority you will be told in writing – either at the time or within 14 days (this includes weekends and public holidays) – what your food hygiene rating is. If you think that the rating is wrong or unfair – in other words it does not reflect the hygiene standards at the time of inspection – you can appeal against this. It is a good idea to speak informally first of all to the food safety officer that undertook the inspection of your premises – you will be given the contact details for this officer when you are notified about your rating. This will help you to understand how your rating was worked out and to see if still want to appeal it. Officer for Food – you will be given the contact details for this officer when you are notified about your rating. holidays. If you do not appeal within this time, your local authority will publish your food hygiene rating online at food.gov.uk/ratings. If you make an appeal, food.gov.uk/rating will show that your food hygiene rating is ‘awaiting publication’. The Lead Officer for food or his/her designated deputy, or the Lead Officer or his/her designated deputy in another authority that is also operating the FHRS, will review your case. The officer that gave the rating will not consider your appeal. In some circumstances, a further visit to your premises may be required. You will be notified of the result of the appeal within a maximum of seven days from the date that the appeal was received by your local authority. Once you have been notified of the result of your appeal, your rating will be published online at food.gov.uk/ratings. You can challenge the local authority’s decision by judicial review. Even if you decide to do this, your rating will still be published at food.gov.uk/ratings. If you think that your local authority has not followed processes properly, you can use the council’s complaints procedure (including taking the matter to the Local Government Ombudsman where appropriate). You should be able to find details of how to complain on your local authority’s website. This lets you explain to your customers any actions you have taken to improve hygiene standards at your premises since your inspection or to say if there were unusual circumstances at the time of the inspection that might have affected your rating. You should send your comments in writing to the food safety officer that undertook the inspection of your premises – you will be given the contact details for the officer when you are notified about your rating. You can do this by completing a standard form which you can download here or you can send a letter or an email. Your local authority may edit your comments in order to remove any offensive, defamatory, clearly inaccurate or irrelevant remarks. Other than that, what you say in your ‘right to reply’ will then be published online together with your hygiene rating at food.gov.uk/ratings. The ‘right to reply’ will remain on the website until you are given a new rating. 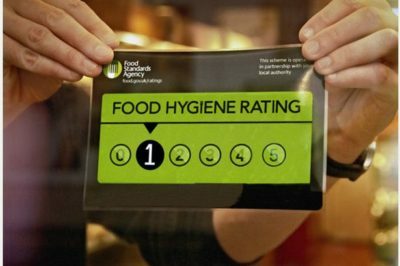 If you make the improvements to hygiene standards that the local authority food safety officer told you about at your last planned inspection you can ask for a re-visit before the next planned inspection so that the hygiene standards in your premises can be reassessed with a view to giving you a new and higher food hygiene rating. safety officer or ask for further help on how to make improvements. specific areas you have been working to improve – so your hygiene rating could well go up, down or remain the same. Not at the moment but it is possible that this may change in the future. You should put your request in writing to the food safety officer that undertook the inspection of your premises – you will be given the contact details for this officer when you are notified about your rating. matters with the Lead Officer for Food, you, you can use the complaints procedure for your local authority, details of which may be found on the authority’s website. cannot, however, dictate when the re-visit will take place. The re-visit will not usually take place in the first three months following the inspection at which you were given your food hygiene rating. If, however, you were required only to make structural improvements or repairs or to upgrade equipment, your local authority may choose to carry out the requested re-visit sooner than this. expect a re-visit within three months but again you will not be told a specific date and time. If you are still waiting for a re-visit after these times, you can ask the lead officer for food to investigate. If you cannot revolve matters in this way, you can use the complaints procedure for your local authority, details of which may be found on the authority’s website. At the re-visit, the food safety officer will assess the standards of hygiene at your premises and you will be told in writing – either at the time or within 14 days (this includes weekends and bank holidays) – what your new food hygiene rating is. This could stay the same as before, it could go up, or it could down.